We believe in using the best possible concrete. Redi-Mix prices change depending on the quality of the mix we order. It is easy for a concrete contractor to pocket 3-$400.00 by ordering a cheaper concrete mix. This is the #1 reason for concrete driveway problems. A driveway mix needs to have a high cement content for durability and strength and fiber reinforcement for crack reduction and tensile strength. A & R has a small bulldozer for excavation. Even though this piece of equipment costs more than a traditional "bobcat" it is ideal for excavating driveways. Because of the efficiency, sub grade is right and the customer receives a full 4" thick driveway. The driveway also drains properly. A lot of driveways crack unnecessarily because they are thinner than 4"; crews simply get tired of the hard work our dozer does for us. As the owner of the company, customers deal with me from start to finish of their job. I don't believe in the "send a crew out in the morning and hope it goes well" approach. I enjoy designing, excavating, forming, pouring, and finishing concrete driveways. Jobs simply turn out better when your contractor and his crew look forward to work. A & R Flatwork has poured thousands of driveways in the last 15 years. 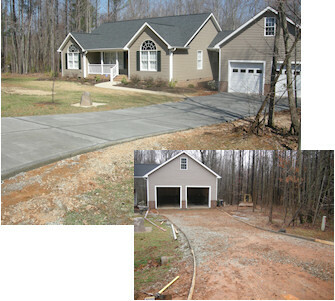 Together, the customer and I can design a concrete driveway intelligently. This will make the best use of your money and space. Color can be added for approximately $.65 per sq ft to compliment architectural elements of your home. Staining concrete has become more popular and can be done to concrete of any age.